Cordelia Frances Biddle will recount the extraordinary story of her own relative, a Philadelphia socialite who became a selfless worker for the welfare and rights of America’s poor. Katharine Drexel’s father, Francis Anthony Drexel, had a fortune so vast he lent $60m to the Union’s cause in the Civil War. Her uncle and mentor founded Drexel University to teach the working class regardless of race, religion or gender. 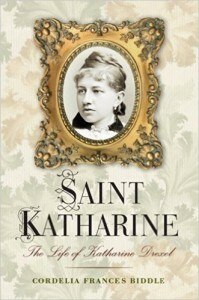 At 27 Katharine inherited staggering wealth from which she gave generously, choosing a path of self-sacrifice and service. She became a missionary at Pope Leo XIII’s suggestion and worked tirelessly among American Indians and African Americans. She was an indefatigable champion of justice and parity until her death from illness in 1955 when “a divine radiance” was said to have emanated from her body. Co-sponsored by RHS and the Library. Books available for purchase. Refreshments will be served. 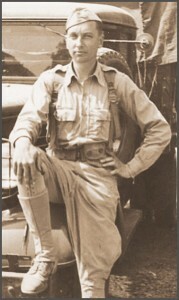 Dr John A Nagl attended the US Military Academy at West Point and subsequently Oxford University as a Rhodes Scholar. Among his many accomplishments he led a tank platoon in the Gulf War and is now Headmaster of The Haverford School, having served as the 2nd President of the Center for a New American Security in Washington DC. He taught undergraduates at West Point and graduate students at Georgetown University. 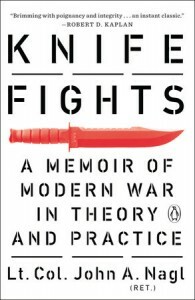 He also wrote “Learning to Eat Soup with a Knife: Counterinsurgency Lessons from Malaya and Vietnam.” Library Journal describes his latest book as, “An honest and informative glimpse into both the past and the future of the ongoing war on terror. Military buffs, policy wonks and anyone wishing to learn more about America’s role in the world should find Nagl’s work an alluring and important read.” As a critic of the Iraq war, Nagl offers perceptive observations on the difficult decisions made by Secretary of Defense Donald Rumsfeld and the military’s general officer corps. Books will be available for purchase. 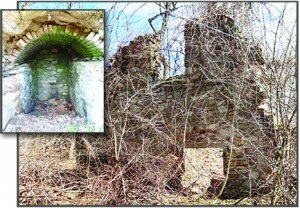 Hidden among the leafy trees, shrubs, wildflowers and vines of Skunk Hollow are the remains of some of Radnor’s oldest structures. Several mills, dams, mill races and a wheelwright’s shop are obscured throughout the summer but after the leaves fall the fascinating ruins are clearly visible and tell the story of what was once a lively industrial hub in what remains the most rural area of Radnor. Put on your walking shoes and join us for a leisurely stroll along the spellbinding, well-trodden paths of our ancestors. Registration required; the event is now full and unfortunately we can’t accept any more participants! For many years the NWPA has held a traditional carol sing as a way to bring neighbors together and spread cheer during the holiday season. 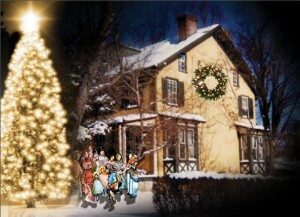 This year’s festive event will take place on the lawn of the Finley House lawn of the Finley House. RHS will open our museum and wagon house for all, so if you’ve not visited for a while take this opportunity to take a look around and see our new exhibits. Hot chocolate and cookies will be served and we’ll have some local historical memorabilia available – excellent for last minute stocking stuffers. We can’t predict wintry snow but we can promise the seasonal atmosphere will be warm and welcoming! Co-sponsored by RHS and the NWPA. This fabulous collection comprises over 300 pieces, including paintings, prints, sculptures, masks and more. All were displayed at the former Rosemont Elementary School but much has been in storage since its demolition in 1980. 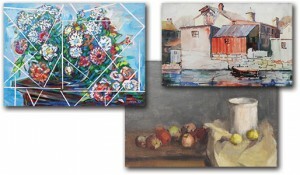 The whole collection includes works by Marc Chagall, Salvador Dali, Seymour Remenick, Christine McGinnis, Alexander Calder and Dolya Goutman, the Rosemont resident and Professor Emeritus at Moore College of Art who donated the first oil in 1961. A selection will be available for viewing from opening day. Co-sponsored by RHS, Wayne Art Center & Radnor School District. Refreshments will be served. Many sensational historic objects have been discovered underneath some of the region’s major construction projects. I-95 through Fishtown and Port Richmond was no exception. Artifacts from around 4,500 years ago have been found during archaeological digging in recent years. Kimberly Morrell will discuss and illustrate some recent work by her company URS, a division of AECOM, in which she serves as Archaeological Supervisor. Ruins of early Native American residences have been found as well as many more modern objects shown here. Together they have enriched our knowledge about the early Lenape tribes as well as later Colonial-era residents. Co-sponsored by RHS and the Library. Refreshments will be served. The RHS Annual Dinner will be held in the Hall of Christ Church Ithan in the year of its centennial celebrations. At 5:30 an organ concert begins in the church, followed by a lecture on the spectacular stained glass windows created by William Willet, celebrated portrait painter, muralist and proponent of medieval stained glass techniques. Our traditional wine and heavenly hors d’oeuvres reception will be followed by a divine dinner and a special presentation on Radnor resident and architect of this magnificent church, Theophilus P. Chandler. Adolph G. Rosengarten, Jr. is best remembered in Radnor as a horticulturist whose enduring legacy includes Chanticleer – but he was also a successful businessman, scholar, lawyer, corporate director, and philanthropist serving on many local Boards. During WW2 he was attached to the top secret Ultra group at Bletchley Park, England, where he analyzed decoded messages from the infamous Enigma machine and was highly decorated for his military service. Marilyn Caltabiano, former Director of Radnor Memorial Library will present taped interviews and provide personal insight into the fascinating man she knew. Her talk will be complemented by Chanticleer’s Executive Director & Head Gardener Bill Thomas who will be illustrating a contemporary view of the garden. His presentation will include images of some unique garden areas, staff-made furniture, new projects and his vision for Chanticleer’s long term future. Co-sponsored by RHS and the Library. Refreshments will be served. Following last year’s very successful excursion to Old St. David’s Church, in which we were asked to participate by our neighbors at the Tredyffrin Easttown and King of Prussia Historical Societies, we will once again get together with our friends in those groups this Spring at the Old Roberts School in the Upper Merion section of Wayne. We will meet in the old schoolhouse for an informative presentation by Michael Morrison on the history of the school and grounds. Following his talk, the group will gather for conversation and refreshments, including delicious tea sandwiches and seasonal beverages, and intrepid visitors are encouraged to explore the grounds, particularly the trails of the adjacent 90-acre McKaig Nature Preserve. In 1848, Jonathan Roberts, farmer and U.S. Senator, built a school to educate the poor children from the mill workers’ houses on Croton Road, and for the pupils from the Henderson, Hughes, and Roberts farms. A ten-acre site was set aside and the first school was built mostly from logs, lasting for 50 years. It was abandoned in 1917, and reverted under terms of its original deed to the Roberts estate. After that it remained abandoned and fell into decay. 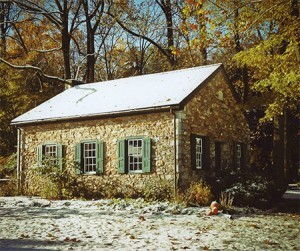 In 1957, the King of Prussia Historical Society initiated a fundraising effort to restore the old school. Today the school remains as a monument to historic preservation under the watchful eye and constant care of the Upper Merion Park and Historic Foundation.